If you want to set up a shared Internet connect with hardware, you have to collect your modem, cables and router. Not only does using a dedicated piece of hardware free one of the Macs on your network from the job of hosting the shared connection, but it also keeps you from having to have more than one Ethernet connection on a single computer if you’re using a cable/DSL modem for your Internet access. You would connect your devices for hardware Internet sharing by using either a cable/DSL router with a built-in Ethernet switch or a cable/DSL router with a stand-alone Ethernet switch, as you would need to use AirPort or AirPort Extreme. The router hosts the shared connection. If you choose to buy a cable/DSL router that has a built-in Ethernet switch, you can simply connect all your computers on the LAN to the built-in switch. 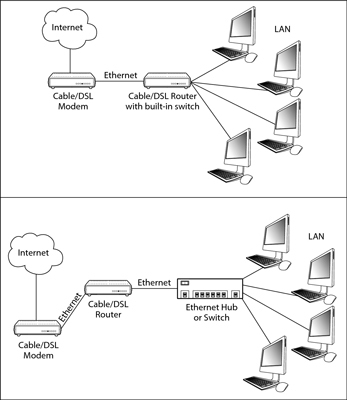 However, if you buy a cable/DSL router that has only a single LAN connection, as with older versions of the AirPort Base Station, you must connect that single LAN connection to an external hub or switch in order to get all the computers on the same network. This refers to wired Ethernet. Wireless connections don’t require a port on your router or base station. Regardless of whether you use the hardware or software method to share your Internet connection, all the computers on your LAN ¯ except the one that’s doing the sharing, if you’re using software sharing ¯ should be configured to obtain its IP address automatically through your old friend, Dynamic Host Configuration Protocol (DHCP). Although it’s not a requirement that you set up your other devices with DHCP, it’s recommended unless you understand the IP addressing scheme required by your cable/DSL router and you’re willing to set up the addresses manually. You need to follow the instructions that come with the cable/DSL router or software that you purchase for detailed information on how to configure that.